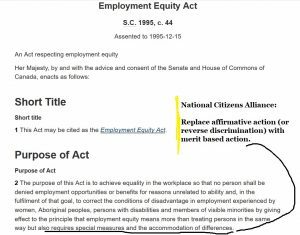 The National Citizens Alliance believes employment practices should be based upon equal opportunity. However, as a party we reject affirmative action, which we view as reverse discrimination. Affirmative action is an attempt to make up for apparent past discrimination in employment practices by favouring the beneficiaries of affirmative action, whether or not the beneficiaries have actually faced discrimination, in employment opportunities. In addition, affirmative action is used by the federal government to protect and enhance minority cultures by favouring beneficiaries from these cultures in employment opportunities. The Amendment of the Employment Equity Act policy statement requires a vote of the NCA membership to be adopted. A minimum 70 percent voting membership must support the policy and with a 50 percent quorum of voting membership as per the NCA Constitution (2014).